Any parent who’s been asked to read the same picture book 20 times in a row understands that young children can be creatures of habit and like repetition. I’ve found the same to be true with ebooks and apps – my son tends to use the same few over and over and over. For the sake of Mommy’s sanity and to help him branch out a little bit from time to time, I’ve tried some different methods for introducing him to new apps. For the record, the obvious approach (“Look, we have a new ebook! Want to try it?”) absolutely does not work with my kid. It only generates resistance. I’ve found that similar approaches work for introducing ebooks as for print. When we get new books, I just put them in the big pile of books on my son’s bed and let him discover them for himself. He’ll ignore them for awhile, but eventually will pick them up and browse through. With ebooks and apps, I put new ones into his folder on my iPad and just wait for him to realize they are there. At first he’ll open the app, look around for a minute and then abandon it. Gradually he’ll spend more time exploring each time he opens it, and within a week or so, if he likes it, it’s become part of his regular rotation. If I’m really excited about a new app and don’t have the patience to wait for him to discover it on his own, the surefire method for getting his interest is to let him see me using the app. I just wait until he’s out of the room, open it up and start reading. He can’t resist the lure of the iPad, so as soon as he sees me using it he’ll come sit with me and check out whatever I’m doing. The first chance he gets he’ll take over and start exploring on his own. How about you? 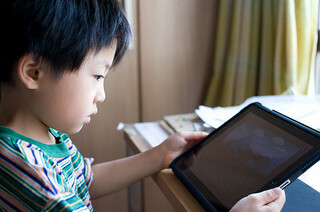 Do your kids take easily to new apps and ebooks? How do you get them to try new things? Posted on May 7, 2012, in Apps, eBook, Field Notes, Media Literacy. Bookmark the permalink. Leave a comment.